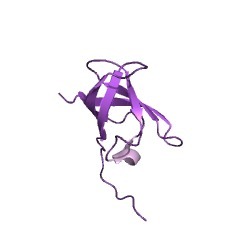 A conserved domain of about 70 amino acids has been found in prokaryotic and eukaryotic single-strand nucleic-acid binding proteins [(PUBMED:1622933), (PUBMED:2184368), (PUBMED:8022259), (PUBMED:9586995), (PUBMED:10446180)]. 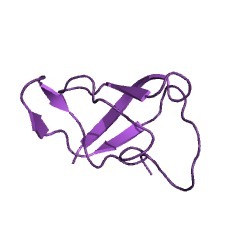 This domain, which is known as the 'cold-shock domain' (CSD) is present in the proteins listed below. 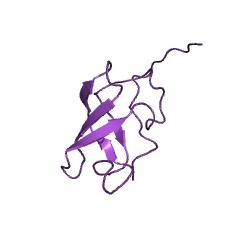 Escherichia coli protein CS7.4 (gene cspA) which is induced in response to low temperature (cold-shock protein) and which binds to and stimulates the transcription of the CCAAT-containing promoters of the HN-S protein and of gyrA. 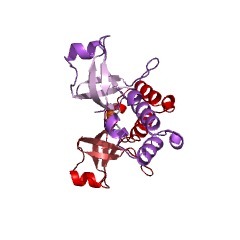 Transcription termination factor Rho, a prokaryotic protein which facilitates transcription termination. 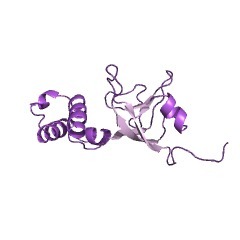 Mammalian Y box binding protein 1 (YB1). 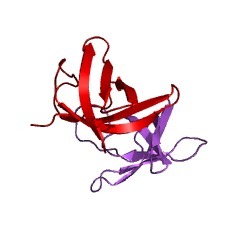 A protein that binds to the CCAAT-containing Y box of mammalian HLA class II genes. 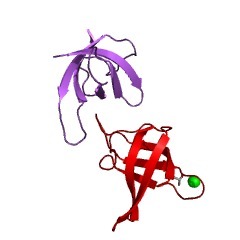 Xenopus Y box binding proteins -1 and -2 (Y1 and Y2). 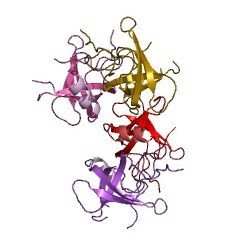 Proteins that bind to the CCAAT-containing Y box of Xenopus hsp70 genes. 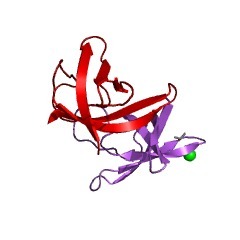 Xenopus B box binding protein (YB3). 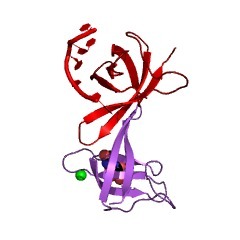 YB3 binds the B box promoter element of genes transcribed by RNA polymerase III. 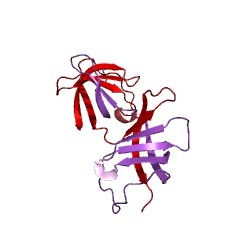 Enhancer factor I subunit A (EFI-A) (dbpB). 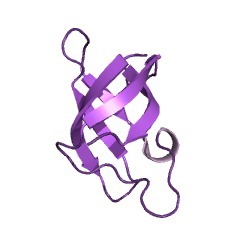 A protein that also bind to CCAAT-motif in various gene promoters. 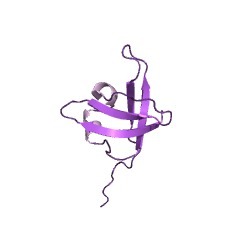 DbpA, a human DNA-binding protein of unknown specificity. 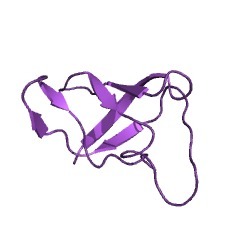 Bacillus subtilis cold-shock proteins cspB and cspC. 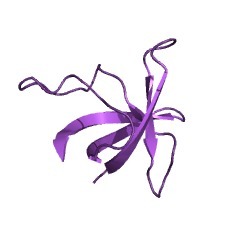 Streptomyces clavuligerus protein SC 7.0. 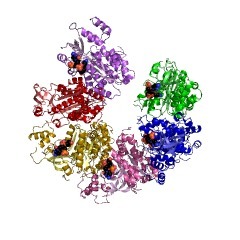 E. coli proteins cspB, cspC, cspD, cspE and cspF. 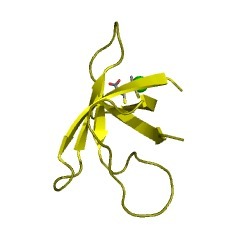 Unr, a mammalian gene encoded upstream of the N-ras gene. Unr contains nine repeats that are similar to the CSD domain. 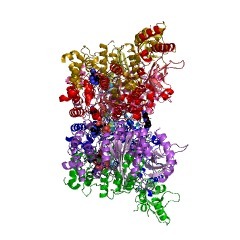 The function of Unr is not yet known but it could be a multivalent DNA-binding protein. 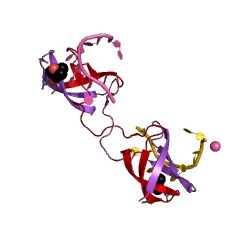 PPPin, a mammalian brain-specific protein that binds to histone mRNA and which is thought to play a role in the regulation of brain development. 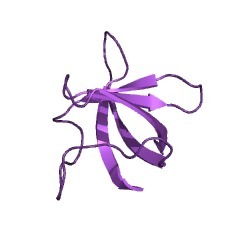 There are 80336 CSP domains in 70472 proteins in SMART's nrdb database. Taxonomic distribution of proteins containing CSP domain. This tree includes only several representative species. The complete taxonomic breakdown of all proteins with CSP domain is also avaliable. 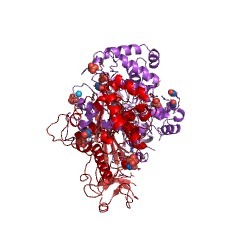 Click on the protein counts, or double click on taxonomic names to display all proteins containing CSP domain in the selected taxonomic class. 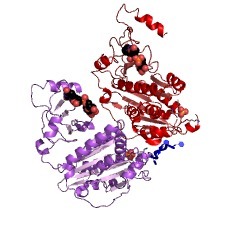 The structural basis for terminator recognition by the Rho transcription termination factor. 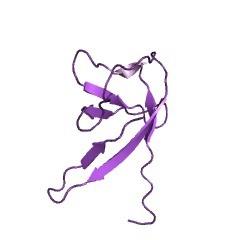 The E. coli Rho protein disengages newly transcribed RNA from its DNA template, helping terminate certain transcripts. 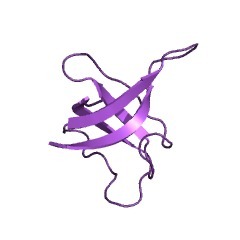 We have determined the X-ray crystal structure of the RNA-binding domain of Rho complexed to an RNA ligand. Filters that screen both ligand size and chemical functionality line the primary nucleic acid-binding site, imparting sequence specificity to a generic single-stranded nucleic acid-binding fold and explaining the preference of Rho for cytosine-rich RNA. 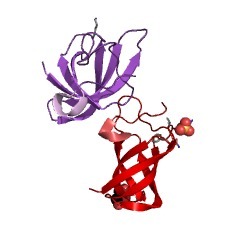 The crystal packing reveals two Rho domain protomers bound to a single RNA with a single base spacer, suggesting that the strong RNA-binding sites of Rho may arise from pairing of RNA-binding modules. Dimerization of symmetric subunits on an asymmetric ligand is developed as a model for allosteric control in the action of the intact Rho hexamer. 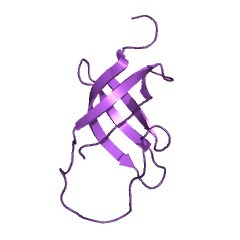 Crystal structure of the RNA-binding domain from transcription termination factor rho. Transcription termination factor rho is an ATP-dependent hexameric helicase found in most eubacterial species. 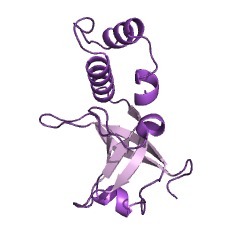 The Escherichia coli rho monomer consists of two domains, an RNA-binding domain (residues 1-130) and an ATPase domain (residues 131-419). 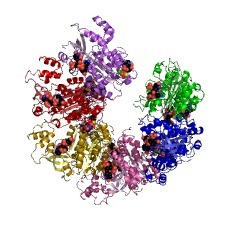 The ATPase domain is homologous to the beta subunit of F1-ATPase. 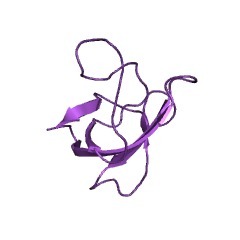 Here, we report that the crystal structure of the RNA-binding domain of rho (rho130) at 1.55 A confirms that rho130 contains the oligosaccharide/oligonucleotide-binding (OB) fold, a five stranded beta-barrel. The beta-barrel of rho130 is also surprisingly similar to the N-terminal beta-barrel of F1 ATPase, extending the applicability of F1 ATPase as a structural model for hexameric rho. 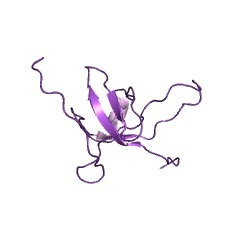 The NMR structure of the RNA binding domain of E. coli rho factor suggests possible RNA-protein interactions. 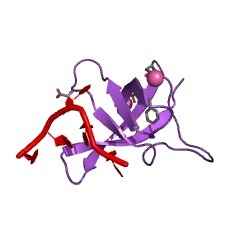 Rho protein is an essential hexameric RNA-DNA helicase that binds nascent mRNA transcripts and terminates transcription in a wide variety of eubacterial species. 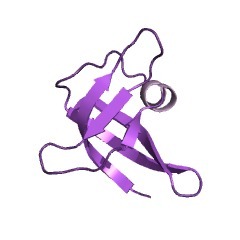 The NMR solution structure of the RNA binding domain of rho, rho130, is presented. 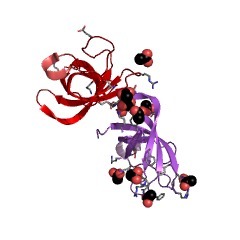 This structure consists of two sub-domains, an N-terminal three-helix bundle and a C-terminal beta-barrel that is structurally similar to the oligosaccharide/oligonucleotide binding (OB) fold. 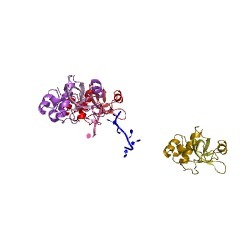 Chemical shift changes of rho130 upon RNA binding and previous mutagenetic analyses of intact rho suggest that residues Asp 60, Phe 62, Phe 64, and Arg 66 are critical for binding and support the hypothesis that ssRNA/ssDNA binding is localized in the beta-barrel sub-domain. 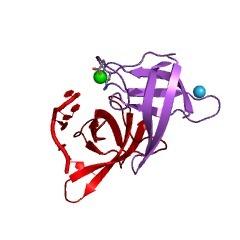 On the basis of these studies and the tertiary structure of rho130, we propose that residues Asp 60, Phe 62, Phe 64, Arg 66, Tyr 80, Lys 105, and Arg 109 participate in RNA-protein interactions. 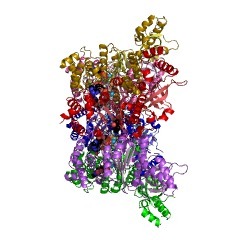 A superfamily of proteins that contain the cold-shock domain. 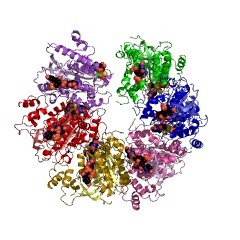 Members of a family of cold-shock proteins (CSPs) are found throughout the eubacterial domain and appear to function as RNA-chaperones. They have been implicated in various cellular processes, including adaptation to low temperatures, cellular growth, nutrient stress and stationary phase. 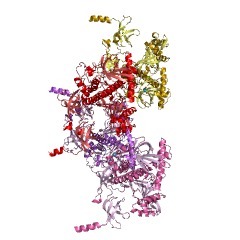 The discovery of a domain--the cold-shock domain--that shows strikingly high homology and similar RNA-binding properties to CSPs in a growing number of eukaryotic nucleic-acid-binding proteins suggests that these proteins have an ancient origin. 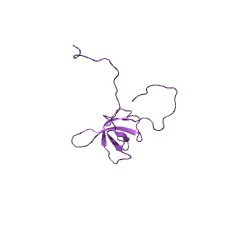 The solution structure of ribosomal protein S4 delta41 reveals two subdomains and a positively charged surface that may interact with RNA. 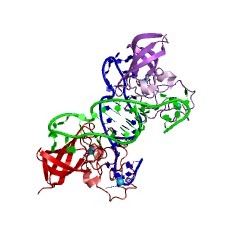 S4 is one of the first proteins to bind to 16S RNA during assembly of the prokaryotic ribosome. 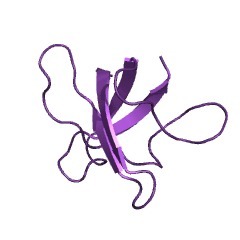 Residues 43-200 of S4 from Bacillus stearothermophilus (S4 Delta41) bind specifically to both 16S rRNA and to a pseudoknot within the alpha operon mRNA. 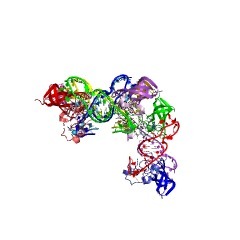 As a first step toward understanding how S4 recognizes and organizes RNA, we have solved the structure of S4 Delta41 in solution by multidimensional heteronuclear nuclear magnetic resonance spectroscopy. 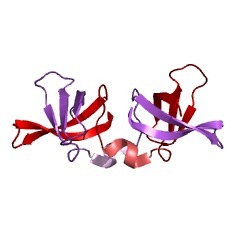 The fold consists of two globular subdomains, one comprised of four helices and the other comprised of a five-stranded antiparallel beta-sheet and three helices. 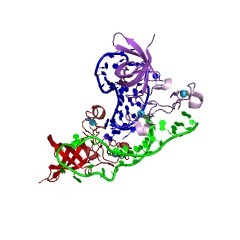 Although cross-linking studies suggest that residues between helices alpha2 and alpha3 are close to RNA, the concentration of positive charge along the crevice between the two subdomains suggests that this could be an RNA-binding site. In contrast to the L11 RNA-binding domain studied previously, S4 Delta41 shows no fast local motions, suggesting that it has less capacity for refolding to fit RNA. 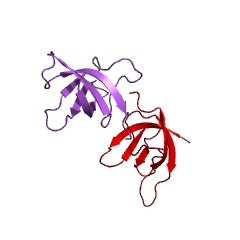 The independently determined crystal structure of S4 Delta41 shows similar features, although there is small rotation of the subdomains compared with the solution structure. The relative orientation of the subdomains in solution will be verified with further study. The cold-shock response in both Escherichia coli and Bacillus subtilis is induced by an abrupt downshift in growth temperature. It leads to the increased production of the major cold-shock proteins, CS7.4 and CspB, respectively. 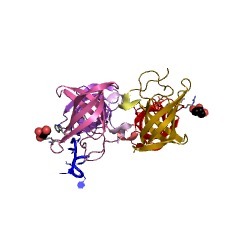 CS7.4 is a transcriptional activator of two genes. 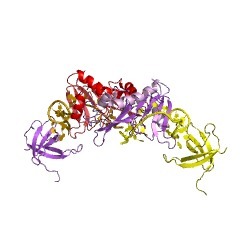 CS7.4 and CspB share 43 per cent sequence identity with the nucleic acid-binding domain of the eukaryotic gene-regulatory Y-box factors. 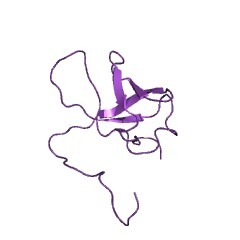 This cold-shock domain is conserved from bacteria to man and contains the RNA-binding RNP1 sequence motif. 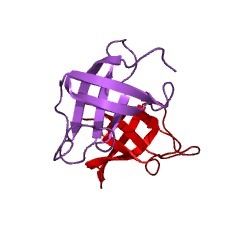 As a prototype of the cold-shock domain, the structure of CspB has been determined here from two crystal forms. 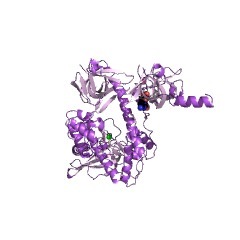 In both, CspB is present as an antiparallel five-stranded beta-barrel. 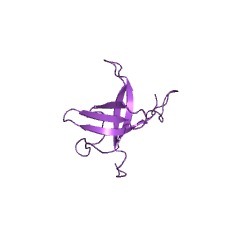 Three consecutive beta-strands, the central one containing the RNP1 motif, create a surface rich in aromatic and basic residues that are presumably involved in nucleic acid binding. Preferential binding of CspB to single-stranded DNA is observed in gel retardation experiments. 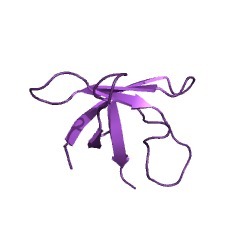 Structure in solution of the major cold-shock protein from Bacillus subtilis. 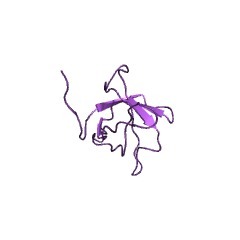 The cold-shock domain (CSD) is found in many eukaryotic transcriptional factors and is responsible for the specific binding to DNA of a cis-element called the Y-box. The same domain exists in the sequence of the Xenopus RNA-binding proteins FRG Y1 and FRG Y2 (refs 1, 3). 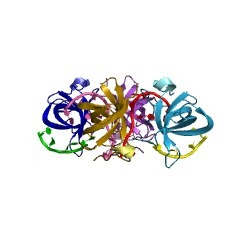 The major cold-shock proteins of Escherichia coli (CS7.4) and B. subtilis (CspB) have sequences that are more than 40 per cent identical to the cold-shock domain. 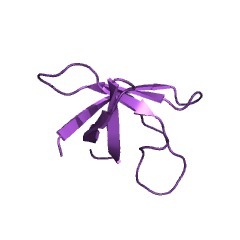 We present here the three-dimensional structure of CspB determined by nuclear magnetic resonance spectroscopy. 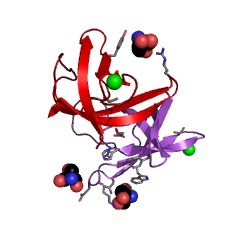 The 67-residue protein consists of an antiparallel five-stranded beta-barrel with strands connected by turns and loops. 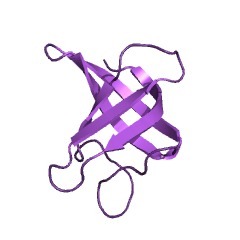 The structure resembles that of staphylococcal nuclease and the gene-5 single-stranded-DNA-binding protein. 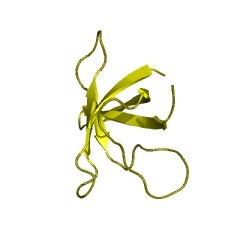 A three-stranded beta-sheet, which contains the conserved RNA-binding motif RNP1 as well as a motif similar to RNP2 in two neighbouring antiparallel beta-strands, has basic and aromatic residues at its surface which could serve as a binding site for single-stranded DNA. 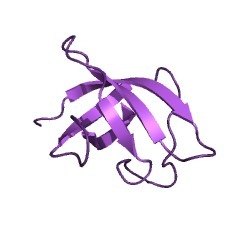 CspB binds to single-stranded DNA in gel retardation experiments. This information is based on mapping of SMART genomic protein database to KEGG orthologous groups. 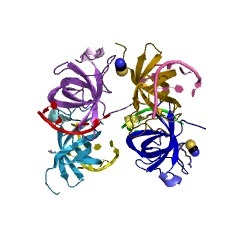 Percentage points are related to the number of proteins with CSP domain which could be assigned to a KEGG orthologous group, and not all proteins containing CSP domain. Please note that proteins can be included in multiple pathways, ie. the numbers above will not always add up to 100%. 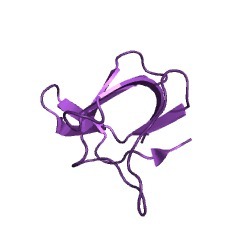 2kcm Solution NMR structure of the N-terminal OB-domain of SO_1732 from Shewanella oneidensis. 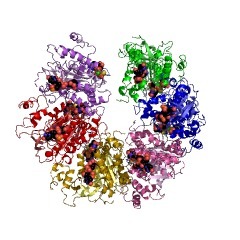 Northeast Structural Genomics Consortium Target SoR210A. 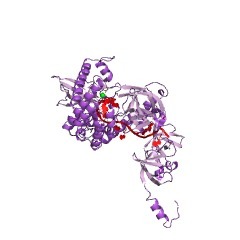 4a75 The Lin28b Cold shock domain in complex with hexathymidine.